With this commission and gift of the Spirit, Jesus gave them a message to take to the world—the message of forgiveness. This commission is similar to the one Jesus gave to Peter in Matthew 16. After Peter made the good confession, Jesus told him Peter “I will give you the keys of the kingdom of heaven, and whatever you bind on earth will be bound in heaven, and whatever you loose on earth will be loosed in heaven” (Mt. 16:13-19). Both of these commissions offer encouragement to share the good news of God’s realm with the world. Now, there was at least one disciple who was absent that first Easter evening. Thomas heard what the disciples had seen, but he refused to believe their story “unless I see the mark of the nails in his hands, and put my finger in the mark of the nails and my hand in his side.” After all, seeing is believing, and he wanted to see what Mary and the other disciples had seen. Then, perhaps he would believe their story. Then, on the Second Sunday of Easter, as the disciples were gathered in that house, together with Thomas, Jesus appeared to them, and Jesus invited Thomas to come and see and touch the mark of the nails in his hands, and his pierced side, so that he could believe. When he saw and touched the wounds, Thomas, the skeptic, became Thomas the believer, and he cried out: “My Lord and My God!” Yes, like Mary and the other disciples, Thomas saw and he believed. It’s probably unfair to apply the moniker “Doubting” to Thomas, because he really wasn’t any different from Mary or Peter or the Beloved Disciple in his unbelief. They didn’t believe until they saw Jesus. The only difference between him and them, was the timing of his encounter with Jesus. Jesus follows up on Thomas’ confession, by commending those who “have not seen and yet have believed,” which would include each of us. Our faith is dependent on the testimony of those who saw him—Mary, Peter, the Beloved Disciple, Thomas, and the rest of the disciples. We gather here today, even though David Hume, whom I mentioned last week, might be whispering in our ears questions about the feasibility of the resurrection. Despite those whispers, do you believe? That is, are you willing to invest your life in their testimony? In 1 John, the community that formed around John’s message, was given a commandment to believe in the name of Jesus and love one another. If they followed this command, then they would abide in Christ, and he would abide in them, and they would know this to be true because of the presence of the Spirit given to them (1 Jn. 3:23-24). This is the Spirit that Jesus breathed into the disciples and breathes into us, if we abide in him and he abides in us. Mary Magdalene was the first to encounter the risen Christ, and she was the first to be commissioned to proclaim the good news of the resurrection. Then, when she told the other disciples “I have seen the Lord,” she prepared them to encounter Jesus for themselves. Then these disciples prepared Thomas for his encounter, even though he struggled to believe that it was true. Now, through the Spirit, we have received that same message, and with it the promise of forgiveness and life abundant. As John writes at the end of the chapter, concerning the testimony of this book: “these are written so that you may come to believe that Jesus is the Messiah, the Son of God, and that through believing you may have life in his name” (Jn. 20:30-31). With that we return to Jesus’ word about serving the “sending God,” who breathes the Spirit into us. Jaime Clark-Soles writes this of the connection between sending and the Spirit. Jesus never sends us to do what he asks without equipping us for it. 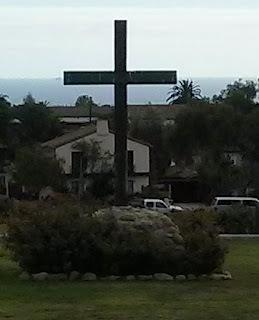 So, just as he bestowed the Spirit on the newly formed church at the foot of the cross (19:31), now he breathes on them with the Holy Pneuma (spirit/breath). Then she writes: “He then reminds them that with great power (the Holy Spirit) comes great responsibility (discerning God’s confrontation with sin and offer of forgiveness).” [Reading John for Dear Life, pp. 141-142]. That is exactly what Jesus does when he breathes into the disciples the Holy Spirit. He prepares them, and all who receive the Spirit, to carry out God’s mission in the world. In the end, it’s not Thomas’s doubting that matters; it’s his believing. Everybody doubts; not everyone believes. Be a believing Thomas; be awestruck and proclaim him “My Lord and my God.” [Reading John, p. 145]. Although Mary and Thomas disappear from the pages of scripture, following these encounters, tradition fills in gaps, if we’re willing to set our imaginations free to hear the stories of how they continued to bear witness to what they saw and heard. Tradition often is based in legend, but as they say, legend often has a kernel of truth. The story of Thomas takes us eastward from Jerusalem, toward India. There is a very ancient church in India that claims Thomas as its founder. It’s not beyond the realm of possibility that the Mar Thoma church is rooted in the work of a person who was transformed by his encounter with the risen Christ on the Second Sunday of Easter. Having heard the proclamation that Jesus is risen, do you hear the call to join Mary and Thomas and the others in believing and then proclaiming the good news that Jesus is risen? Having been with the Spirit, are you ready to share the good news that God has made forgiveness available to the world? Where is God sending you, even as God sent Jesus, and gave us the Spirit, the one who serves as our Advocate and Encourager, as we go forth into the world as followers of Jesus? Picture attribution: Caravaggio, Michelangelo Merisi da, 1573-1610. The Incredulity of Saint Thomas, from Art in the Christian Tradition, a project of the Vanderbilt Divinity Library, Nashville, TN. http://diglib.library.vanderbilt.edu/act-imagelink.pl?RC=54170 [retrieved April 22, 2017]. 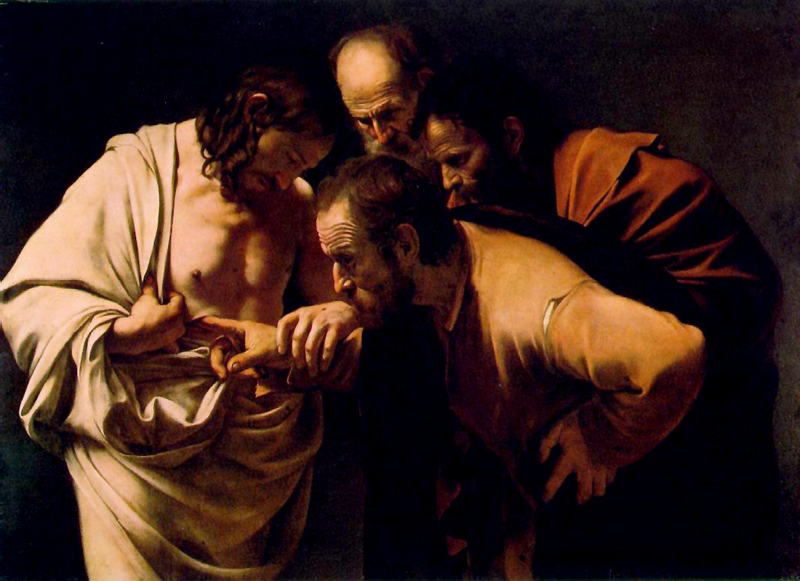 Original source: http://commons.wikimedia.org/wiki/File:The_Incredulity_of_Saint_Thomas_by_Caravaggio.jpg.